Faster, more efficient data storage and computer logic systems could be on the horizon thanks to a new way of tuning electronic energy levels in two-dimensional films of crystal, discovered by researchers at MIT. The discovery could ultimately pave the way for the development of so-called "valleytronic" devices, which harness the way electrons gather around two equal energy states, known as valleys. Engineers have for some time warned that we are reaching the limits of how small we can build conventional electronic transistors, which are based on electrons' electrical charge. As a result, researchers have been investigating the utility of a property of electrons known as spin, to store and manipulate data; such technologies are known as spintronics. But as well as their charge and spin, electrons in materials also have another "degree of freedom," known as the valley index. This is so-called because plotting the energy of electrons relative to their momentum results in a graph consisting of a curve with two valleys, which are populated by electrons as they move through a material. Harnessing this degree of freedom could allow information to be stored and processed in some materials by selectively populating the two valleys with electrons. However, developing such valleytronic devices requires a system to selectively control the electrons within the two valleys, which has so far proven very difficult to achieve. Now, in a paper published today in the journal Science, researchers led by Nuh Gedik, an associate professor of physics at MIT, describe a new way of using laser light to control the electrons in both valleys independently, within atomically thin crystals of tungsten disulfide. "The two valleys are exactly at the same energy level, which is not necessarily the best thing for applications because you want to be able to tune them, to change the energy slightly so that the electrons will move [from the higher] to the lower energy state," Gedik says. Although this can be achieved by applying a magnetic field, even very powerful laboratory magnets with a strength of 10 tesla are only capable of shifting the valley energy level by around 2 millielectronvolts (meV). The researchers have previously shown that by directing an ultrafast laser pulse, tuned to a frequency very slightly below the resonance of the material, they were able to shift the energy of one of the valleys through an effect called the "optical Stark effect," while leaving the other valley virtually unchanged. In this way they were able to achieve a shift in energy level of up to 20 meV. "The light and the electrons inside the material form a type of hybrid state, which helps to push the energy levels around," Gedik says. 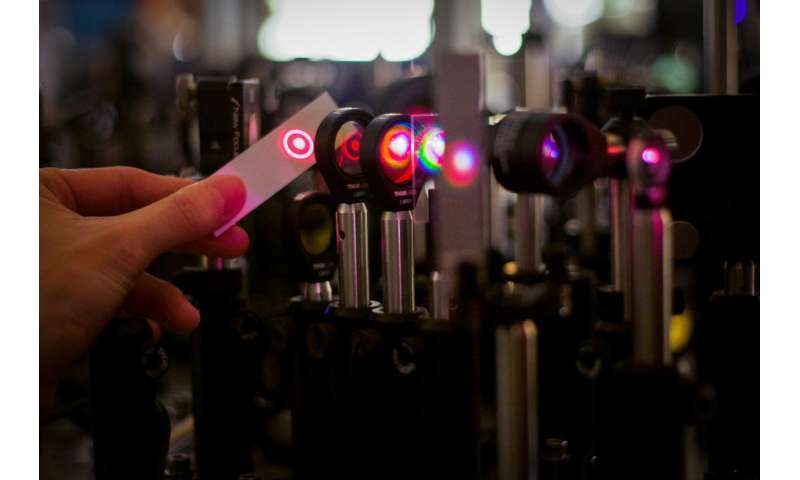 In the latest experiment, the researchers discovered that by tuning the laser frequency to even further below resonance, and increasing its intensity, they were able to simultaneously shift the energy levels of both valleys and reveal a very rare physical phenomenon. While one valley still shifts as a result of the optical Stark shift as before, the other valley shifts through a different mechanism, known as the "Bloch-Siegert shift," according to MIT physics PhD student Edbert Jarvis Sie, the paper's lead author. Although the Bloch-Siegert shift was first predicted in 1940, and soon after helped inspire Willis Lamb to his 1955 Nobel Prize-winning discovery of the Lamb shift in hydrogen atoms, it has remained a considerable challenge to observe it experimentally in solids. Indeed, apart from so-called artificial atoms, the new mechanism has never been observed in solids until now, because the resulting shifts were too small, Sie says. The experiment performed at the Gedik Lab produced a Bloch-Siegert shift of 10 meV, which is 1,000 times larger than that seen previously. What's more, the two effects—the Bloch-Siegert shift and optical Stark shift—have previously tended to take place in the same optical transition, meaning researchers have had difficulty disentangling the two mechanisms, Sie says. "In our work we can disentangle the two mechanisms very naturally, because while one valley exhibits the optical Stark shift, the other valley exhibits the Bloch-Siegert shift," Sie says. "This can work so nicely in this material because the two mechanisms have a similar relationship with the two valleys. They are related by what is called time-reversal symmetry." This should allow for enhanced control over valleytronic properties in two-dimensional materials, Nuh says. "It could give you more freedom in tuning the electronic valleys," he says.